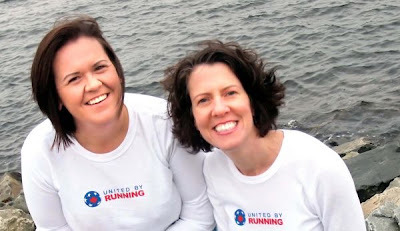 Avid runners Michelle Kempton (left) and Stacy Chesnutt recently started a new race management company called United by Running. It’s a good thing Michelle Kempton and Stacy Chesnutt keep themselves so fit. The two avid runners recently launched United by Running, a new race management company, and are busy planning three new running events for the Halifax area next year. “It’s been a full-time job planning the business over the past few months, but it’s gotten even busier since we announced the races because the response from runners and supporters has been phenomenal,” Kempton said. That’s on top of her regular job as a full-time software programmer, being a mother to seven-year-old twin boys, not to mention the co-founder of Heart & Sole Running Club, the crazy-popular running club that has taken Dartmouth by storm over the past year. Chesnutt’s no slouch either. In October alone the 40-year-old runner won three half-marathons in three different provinces over three consecutive weekends, setting a personal record with a time of 1:26:17 at the Moncton Legs for Literacy event. “I’m obsessed with running. I absolutely love it,” she said. Drawing on each of their strengths and interests as runners, Kempton and Chesnutt have created three different running events for 2012. The first will be Sole Sisters in June, a five-kilometre evening race for women “to celebrate the relationships developed through running and the strength of female runners,” Kempton said. Next will be the Maritime Marathon. Planned for September, a consistently beautiful month in Nova Scotia, there are a couple of coastline route options being considered for a course that is “sure to showcase the beauty of the East Coast,” Chesnutt said. With a 5-km, 10-km and half-marathon event as well as the full marathon event, this will likely be a top draw for most local runners, and hopefully more than a few from out-of-area as well, she added. “I travel all over the world for races and I know a lot of people who do the same thing. This is the most beautiful place I’ve ever lived. We want this to become a destination race,” Chesnutt said. In November the duo will finish off their 2012 series with the Lucky Seven Relay. Racers can either put together their own dream team of three or “try their luck” by being randomly paired with other runners, each of whom will run seven kilometres in the half-marathon event. “There will be plenty of random prize draws and jackpots too, especially for people who cross the finish line seventh, 77th or 777th!” the organizers said. Along with a promise of prize draws at all three race events, Kempton and Chesnutt are planning to offer “swag in the race kits, fun contests, designer race shirts, race photos, healthy food, bling at the finish line and prize money” to lure athletes from across the country and around the world. We want these races to be big, bright events. A real celebration of running and community,” Kempton said. With 28 marathons and too many half-marathons to count under her belt, Chesnutt, who originally hails from Nashville, Tennessee, comes to the planning armed with a long list of dos and don’ts for their events – many of them course related. A race director for the Benny Bulldog 5K Trail Run in Shubie Park, a fundraising event for the St. Leonards Society, Chesnutt has considerable event management experience as well. At 38 years old, Kempton, who lives in Cow Bay, has been running for just four years, participating in 30 races and volunteering at even more. Although she modestly calls herself a “middle-of-the-pack runner” she brings an inspirational story of personal triumph, having decided after the birth of her sons to lose weight and shedding 120 lbs, most of which she attributes to running. “The route and the racing elements are typically my main focus but Michelle has opened my eyes to the whole experience. Together, we make an amazing team,” Chesnutt said.